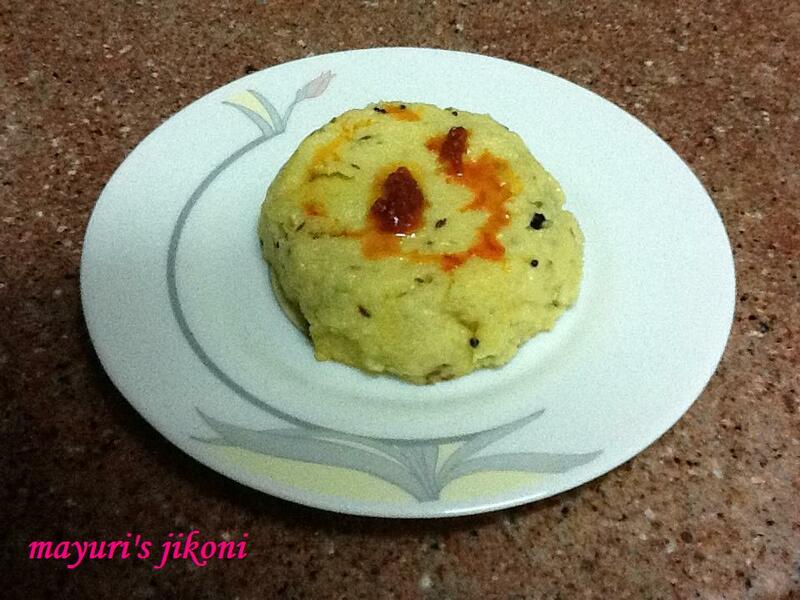 Patuda no lot (patuda dough) is another gujarati quick snack prepared in most homes. The Patels are famous for making patuda no lot just as the Shahs are famous for their khichi. I haven’t the foggiest idea as to why its called patuda no lot. Its basically handvo or dokhra flour cooked in spicy water with yogurt till you get a mass of dough very much like ugali. Its the quickest and yummiest snack. Very famous in UK as its made for lunch, unexpected guests, as a snack…. basically anytime. The tricky part of making this dish is to avoid the flour from getting all lumpy. Over the years I tried out many tricks told to me by my huge clan of relatives but none really worked as I still landed up with raw lumps of dough. Some of the tricks were, to rub the flour with oil, add oil in the boiling water, take the pan off the heat when flour is added etc etc. I still landed up whizzing the dough with a hand blender to get rid of the lumps. What I really have not understood is how mixing the dough with a rolling pin avoids lumps! To cut the long story short, I finally have got the patuda no lot correct without any lumps and all thanks to my bhabhi Arti. So this recipe is definitely dedicated to her. Handvo or dokhra flour is readily available at most Indian grocery shops. Heat oil in a deep pan over medium heat. When it is hot add the cinnamon stick, cloves and peppercorns. When they begin to sizzle, add mustard seeds and cumin seeds. Lower the heat and add the flour, turmeric powder, asafoetida, green chilli, ginger and garlic pastes. Roast the flour over low heat in the oil for about 5 minutes. Make sure you stir it occasionally. Take the pan of the heat and add the hot water and salt and mix well. Return the pan to the heat, add yogurt and mix well. Cover the pan with a lid and let the dough cook over low heat for 5 minutes. Serve immediately with extra oil, garlic chutney or some oil from any pickle. Because of the amount of oil used during cooking, usually extra oil on top is not required. Can use olive oil for serving if you like. Good recipe for packed lunch as it will keep warm in a food flask. Add sesame seeds if you like along with cumin and mustard seeds.